A doctor who tried to help a terminally ill friend die has been struck off the medical register by the General Medical Council. Right-to-die campaigner Dr Michael Irwin, from Surrey, admitted obtaining sleeping pills to help his friend die, but denied the misconduct charge. The 74-year-old has already received a police caution for his actions. A GMC panel said his actions were irresponsible, and found him guilty of serious professional misconduct. Dr Irwin, a former UN medical director and head of the Voluntary Euthanasia Society, had said he is too old to practise medicine, but was fighting the case to highlight his call for a change in the law. 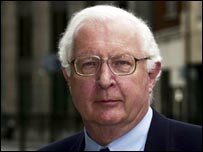 He openly admitted travelling to the Isle of Man in October 2003 with around 60 temazepam sleeping pills to assist fellow campaigner Patrick Kneen to end his life. But Mr Kneen, who had prostate cancer, was too ill to take the medication and slipped into a coma, dying a few days later without Dr Irwin's assistance. Police took the decision not to proceed with the case but he received a caution for possessing the Class C drug with intention to supply. Dr Irwin told the GMC that he had taken about 60 tablets to the Isle of Man, including 30 obtained under his own name at the Moss Pharmacy, in Cranleigh near his home. The other 30 or so were taken from his own "stockpile" which he kept in a locked box in a cupboard in his bedroom. He also admitted taking travel sickness tablets to the island, which would have helped Mr Kneen keep the temazepam down. Professor Ken Hobbs, head of the GMC's fitness to practise panel, said Dr Irwin's actions in writing the prescription in his own name was "an act of deception". And he told Dr Irwin his fitness to practise was impaired and "in all circumstances you have abused your position as a doctor". But Dr Irwin said: "Whatever happens today I assure you I will continue to campaign to see a change in the law to legalise doctor assisted suicide."